Refraction can cause you to see something that may not actually be there. As you look at a fish in a tank, the light coming from the fish to your eye bends as it passes through three different mediums. The mediums are water, the glass of the tank, and air. As the light passes from one medium to the next, it refracts. 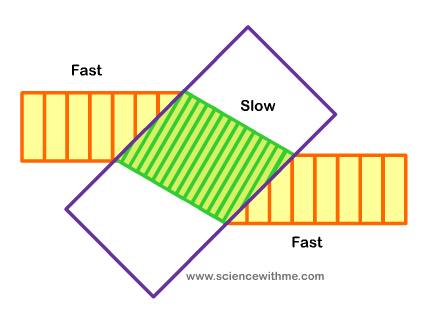 When light rays enter a medium at an angle, the change in speed causes the rays to bend, or change direction. Glass causes light to bend more than either air or water. Another way to say this is that glass has a higher index of refraction than either air or water. A material’s index of refraction is a measure of how much a ray of light bends when it enters that material. The higher the index of refraction of a medium, the more it bends light. 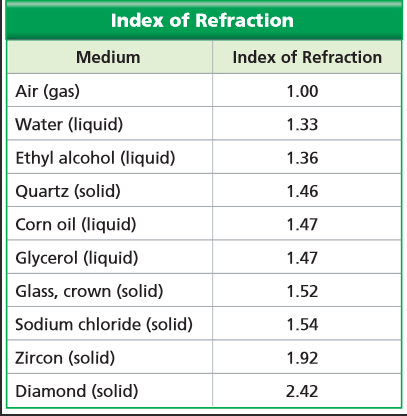 The index of refraction of water is 1.33, and the index of refraction of glass is about 1.5. So light is bent more by glass than by water.